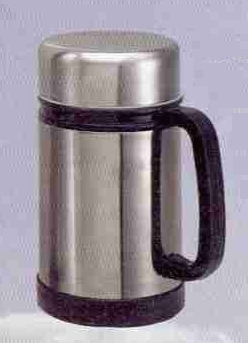 "Between the stainless steel exterior and porcelain interior of this mug lies a material that magnetizes hot or cold liquids. Why? Because magnetizing water, the basis of any liquid, creates space between its molecules, adding alkalinity to water that has become acidic. Alkaline water is more readily absorbed by the body. As your tissues increase their hydration levels, your body flushes out toxins more easily." Magnetize means "to make magnetic." Only iron and a few other metallic substances can be prmanently magnetized. If an external magnetic field is applied to a water sample, the water will develop a temporary internal magnetic field about 100,000 times weaker than the external field. The internal field is in opposite direction to the external field and tends to cancel a tiny part of the external field. Even this tiny effect goes away as soon as the external magnetic field is removed. Therefore, assuming that the mug exerts a minuscule effect on its liquid contents, this effect would disappear as soon as the liquid leaves the mug. The mug cannot influence the space between water molecules. In liquids, water molecules are touching. To exert even a tiny temporary effect on the density of water, a huge magnetic force would be required. Even if the space between water molecules could be influenced, that would not make the water more alkaline. The pH (degree of acidity or alkalinity) of a liquid is determined by its concentration of hydrogen ions. The pH of water does not influence its rate of absorption into the body. The pH of the fluid within the stomach and intestines is determined mainly by secretions of the cells lining the stomach and small intestine. Even if exposure to a magnet could change the rate of water into the body, the speed of absorption of a small amount of water would have no effect on how the body functions. Assuming that someone is not dehydrated to begin with, drinking more water would have no significant effect on cellular hydration. Whatever was absorbed that the body didn't need would be quickly excreted by the kidneys. This analysis was prepared with help from John W. Farley, Ph.D., Professor of Physics at the University of Nevada, Las Vegas. This article was posted on September 19, 1998.